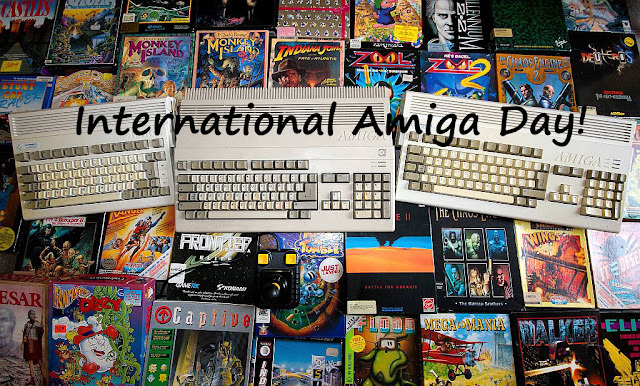 How quick the years pass as once again it is time to celebrate ' International Amiga Day ' which is held every 31st May in celebration of Jay Miner who, according to Gyorgy Dragon(RIP), was the father of the Amiga and today is his birthday! Celebrating 30 years of fun, it's time to celebrate all that is Amiga, from Amiga games to the Amiga hardware. The retro community want to keep the Commodore Amiga name alive and what better way to do that than an anniversary to the day dedicated to the great system. What an incredible line of retro computer systems from the A500 to the A4000, if you lived during that era of gaming then it was one of the greatest moments in our retro history. Last year turned out to be a global event with people from all around the world turning on their retro systems either to play them once more from their childhood or just to give them a new look with a mod or retrobright. However with fantastic news came sadness as the original creator Dragon “Gyu” Gyorgy sadly passed away at the beginning of 2015. He was both a friend to me and to many others, so with this news, lets not just celebrate the Amiga but celebrate the great Dragon Gyorgy who was the inspiration behind the Amiga day. - You must switch on at least 1 Amiga computer. - You must run at least 1 Amiga game (emulator is accepted). - You must „whiten” a yellowed Amiga. - You must give your non-working Amiga to a technician, who can make a working machine out of the non-working ones. Lather on the reborn working Amiga must be donated. - In case you are a technician you must make at least one Amiga working from non-working Amigas. - If you have an Amiga T-Shirt, you must wear it. - If none of the above you can make a photo of yourself with an Amiga and share it with your friends on any social networks. So come on you Amiga lot, lets celebrate!